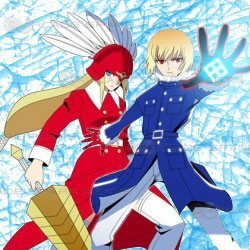 A 2D fighting game from Subtle Style, the creators of popular 2D dojin game Akatsuki Blitzkampf Ausf Achse which was released to arcades in 2008. The game features a variety of interesting characters, as well as an all new game system and art. The game itself uses an 8-way joystick and 4 button system. The game runs on the System Board Y2 arcade hardware released by SI Electronics, LTD. The System Board Y2 is a new PC-Based hardware system, and was also used for The King of Fighters 2002: Unlimited Match release. This board can work with both JAMMA and JVS.